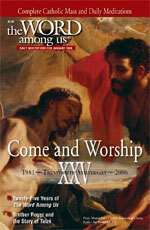 The Word Among Us is best known for our monthly Catholic devotional, first published in 1981. The Word Among Us is now published in 14 languages with over 500,000 copies of each issue distributed in over 90 countries. Click here to visit The Word Among Us Magazine web site. For more on the history of The Word Among Us click here.To best meet the needs of our readers, we offer several editions of The Word Among Us in print. Each edition features all the content of The Word Among Us. Meditations based on the daily Mass readings for every day of the month that will bring the Scripture passage alive and help encourage you to experience God's presence every day. Essays that follow on the theme of each issue. Saint of the Month - Deepen your love for the saints and be inspired by how they conquered life's challenges. 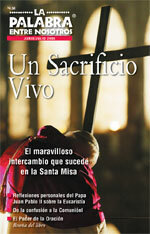 Articles on the Holy Father and testimonies that will inspire you. Click here to view the current issue of The Word Among Us online. The Complete Order of Mass: Experience the presence of Jesus every day as you pray through the Eucharistic liturgy and the daily prayers of the Church. The Daily Scripture readings from Mass: Enjoy the richness and uniqueness of your Catholic journey as you read and reflect on each day's Mass Scripture readings. Published ten times a year, La Palabra Entre Nosotros is the spanish edition of The Word Among Us.